To The Outer Reaches. Kris Davis looks to discover the piano’s full potential. At 7 a.m., 90 minutes before our scheduled interview on Christmas Eve morning, Kris Davis sent an email: “bad night of sleep — call you when I’m up — around 9:30.” We were supposed to speak the previous night, but she emailed me before the appointed time to say that a second consecutive day of recording an orchestral album with saxophonist Ingrid Laubrock at Manhattan’s Power Station left her too punchy “to do you much good.” When we finally connected at 9:30 sharp, Davis explained that she’d been up most of the night soothing her 4-year-old son through serial nightmares. It was our second rescheduling moment of the week. Six days earlier, we postponed our first scheduled interview when Davis awoke in the morning with a stomach virus her son had picked up at school. In that instance, too, we spoke the next morning, after which, Davis told me later, she treated herself to a rare “day off” that entailed practice, exercise and hanging out with her son. Between our conversations, Davis had pursued her customarily industrious schedule, which included a commute from her Ossining, New York, home to Manhattan to teach piano and guide the Herbie Hancock Ensemble at the New School; a two-hours-each-way drive to teach jazz piano at Princeton; and two long rehearsals with Laubrock. The day after our second talk, she led a new trio with Eric Revis and Johnathan Blake at a John Zorn-produced evening at the New School’s Tishman Auditorium, then worked three consecutive nights as a sidewoman, first in saxophonist Jure Pukl’s quintet at the Cornelia Street Café in Greenwich Village, then in a quintet assembled by Revis to play a newly commissioned suite over two nights at the Jazz Gallery in midtown Manhattan. Davis hadn’t exactly been slacking off before our first chat. On December 7th, she drove to New Haven for a free-improv concert with trumpeter Taylor Ho Bynum, followed by four collectively improvised sets over two nights at Manhattan’s Jazz Gallery with Borderlands Trio — a cooperative unit with bassist Stephan Crump and drummer Eric McPherson — in support of their new album, Asteroidea (Intakt). Somehow, Davis carved out time in 2016 and 2017 to debut and develop her own label, Pyroclastic, on which she released her 12th and 13th albums as a leader or co-leader. The 13th, Octopus, comprises six far-ranging piano duos with Craig Taborn culled from three concerts on a 12-date U.S. tour in October 2016. Their association gestated when they first made music together, on Davis’ 12th album, Duopoly, a tour de force on which, over three days in May 2015, she recorded two duos apiece — one composed, one improvised — with guitarists Bill Frisell and Julian Lage, pianists Taborn and Angelica Sanchez, drummers Billy Drummond and Marcus Gilmore, and reedists Tim Berne (alto saxophone) and Don Byron (clarinet). Sanchez was teaching improvisation and composition at the Banff Center for the Arts when she met Davis, just past her second year at the University of Toronto, in the summer of 2000. Born in Vancouver and raised in Calgary, Davis received classical training from age 6 and became enamored of jazz at 12, when her ability to read music and play scales gained her entry into her middle-school jazz band. Directly after graduating, Davis moved to Brooklyn, where she reconnected with Malaby and Sanchez. A Canada Council grant enabled lessons with Jim McNeely, whose ideas on “non-functional harmony” inflect her rather mainstream 2002 debut, Life Span. That record, Davis says, reflects “a mentality of playing jazz, playing standards, coming from people like Kenny Wheeler, who is a big influence on Canadian artists.” But you can hear her consciousness transforming on 2006’s The Slightest Shift and 2008’s Rye Eclipse, both venturesome quartet sessions with Malaby, and on the turbulent 2005 recording Fiction Avalanche, by the collective RIDD Quartet, with saxophonist Jon Irabagon, bassist Reuben Radding and drummer Jeff Davis. Also transformational for Davis was a summer 2005 trip to France spent studying prepared-piano concepts and techniques with Delbecq. She describes the sojourn as “another step in trying to explore the outer reaches of what could be accomplished on the piano, or how I might use the piano differently within an improvisational setting.” Both were enamored of the polyphony-oriented, West African- and Balkan-inspired piano études of the Hungarian composer György Ligeti. “The idea of taking from different genres and using it for another purpose made a big impact,” Davis says. Then Sanchez introduced her to the work of Austrian composer Thomas Larcher, who alters the harmonics of piano strings by applying gaffer tape and rubber wedges, and she analyzed his procedures. 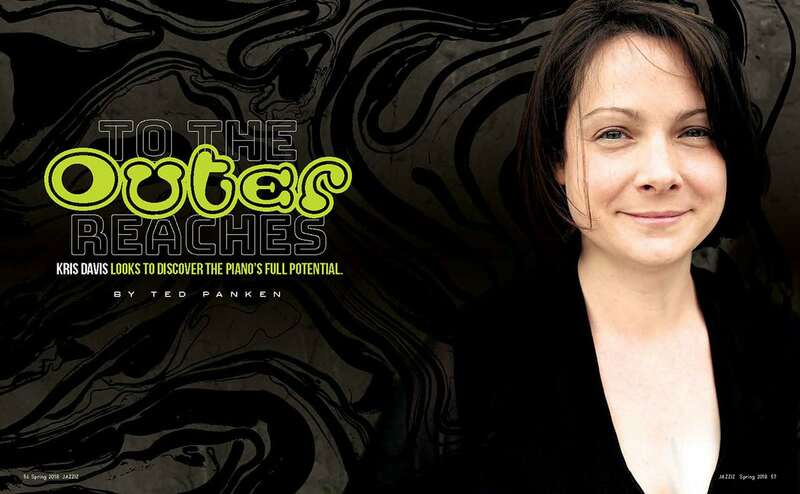 Also in 2009, Davis, then 29, introduced her prepared-piano investigations on Aeriol Piano, a solo recital of great originality, and convened bassist John Hébert and drummer Tom Rainey to make Good Citizen, on which she refracted language culled from Ligeti, Monk, Morton Feldman, Cecil Taylor, Paul Bley and others into her own authoritative voice. Stephan Crump admired Paradoxical Frog and Aeriol Piano so much that, according to the bassist, he called Davis in 2014 to meet for informal duo sessions “to get to know each other and see if there was chemistry.” Over time, McPherson entered the mix, and each member agreed that on-the-spot improvisation (Crump calls it “spontaneous composition”) should be the group’s m.o. “Whether she’s playing the piano wide-open or with some of her preparations, Kris clearly has a powerful sense of orchestration,” Crump says. “By playing with the harmonics on the strings, she essentially creates different sections of her instrument, almost as if you had an orchestra with a woodwind section, a string section and percussion. Paradoxical Frog also drew in Revis, whose latest release, Sing Me Some Cry (Ken Vandermark plays tenor sax and clarinet; Chad Taylor plays drums), marks his third leader recording with Davis. He toured that quartet last spring in Europe, and a trio with Davis and drummer John Betsch in the summer. Davis’ tours with Taborn and Revis (with whom, in the spring, she will play duo for 10 days in Japan) augur future encounters outside the nurturing circle of musicians she bonded with — and with whom she continues to play — during her 14 years in Brooklyn. Her January itinerary, for example, included a duo with Ambrose Akinmusire at The Stone and tributes to the late pianist Geri Allen, with drummer Terri Lyne Carrington, at New York’s Winter Jazz Festival and Harvard. In July she’s booked to tour with Carrington and tenor saxophonist David Murray, assuming the role Allen played with those two musicians on the 2016 CD Power Trio. 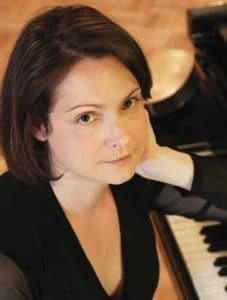 One of the many dimensions of Kris Davis’ longstanding friendship with fellow pianist Angelica Sanchez is their mutual obsession with finding new composers and musical ideas to draw upon and experiment with in developing their own musical productions.